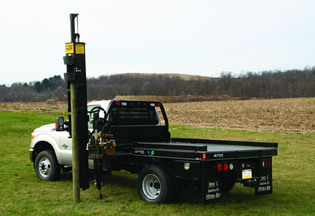 The Kiwi Post Driver can be mounted to the chassis of a one ton or larger truck. This option offers one-unit convenience, transporting both materials and crew, as well as working on the job site. Pump Size 23 GPM @1500 PSI Unit Weight 2800 lbs.